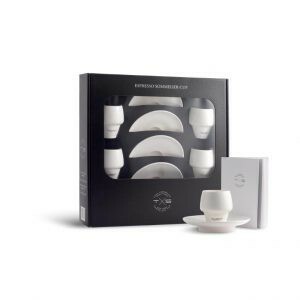 We’re proud to be the sole UK distributor for the totally unique and beautiful Café Saula ‘Taza Sommelier’, a set of 4 stunning, white porcelain Sommelier Coffee Cups and Saucers from Café Saula, available via Amazon . 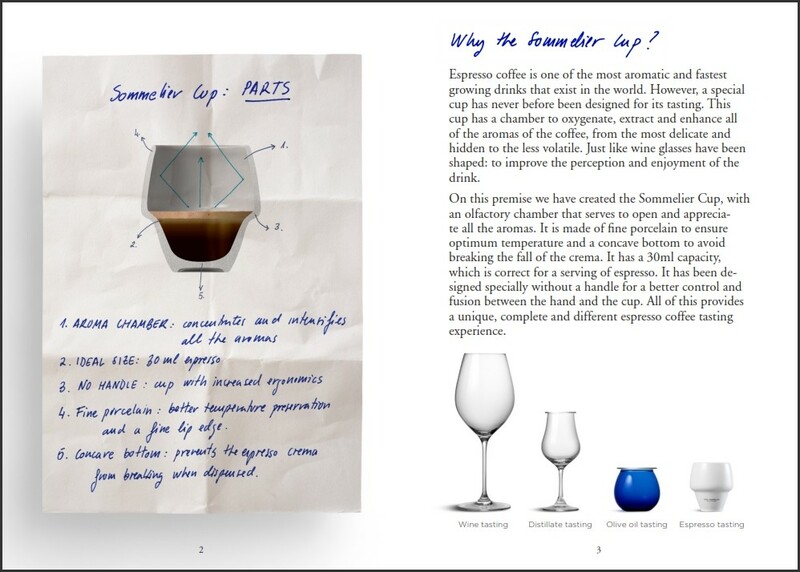 Designed by Lluis Saula himself, like wine and spirit glasses the cups have been shaped to bring out the best in taste and aroma and improve the perception and enjoyment of the drink for amateur coffee connoisseurs and coffee professionals alike. 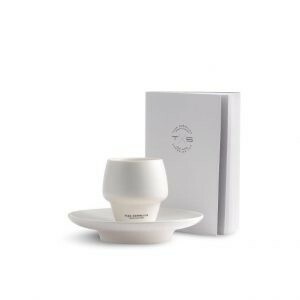 Their chamber helps oxygenate, extract and enhance all the aromas of the coffee, from the most delicate and hidden to the less volatile. 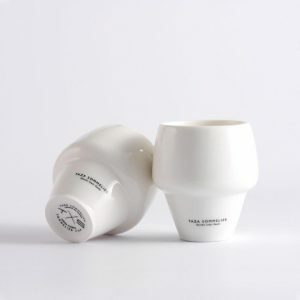 They also have no handle for better control and fusion between the hand and the cup, while the concave bottom avoids breaking the fall of the crema. This video will give you a fantastic insight into what it takes to be a Coffee Sommelier thanks to Master Roaster and Sommelier Lluis Saula’s expertise and family history making some of the world’s finest coffee. 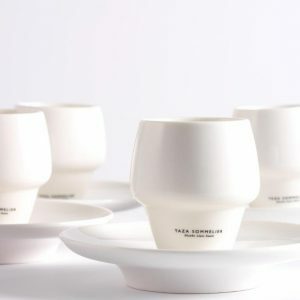 1) FINE PORCELAIN: Better temperature preservation, retaining the temperature longer than a standard espresso cup. Up to 6°C warmer after 3 minutes of dispensing. 2) AROMA CHAMBER: Concentrates and intensifies aroma profiles. 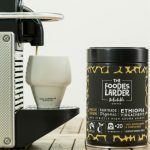 The unique chamber acts to oxygenate, extract and enhance all of the aromas of the coffee, from the most delicate and hidden to the less volatile. 3) ENHANCED ERGONOMICS: Specifically designed without a handle for improved control and fusion between the hand and the cup. 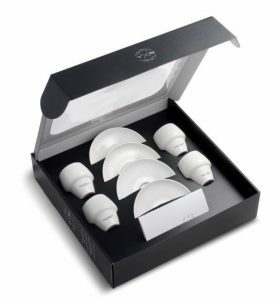 4) CONCAVE BOTTOM: Prevents the espresso crema from breaking when dispensed. 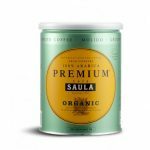 5) UNIQUE PATENTED DESIGN: Designed by Lluis Saula, Master Roaster & Sommelier from Café Saula, a family-owned coffee roasting company based in the Spanish city of Barcelona who have been producing some of the very best coffee in Europe for over 65 years. 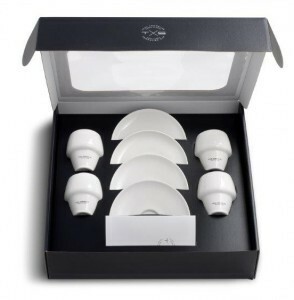 The ‘Taza Sommelier’ Set includes 4 White Fine Porcelain Sommelier cups and saucers in a beautiful presentation box, together with a comprehensive 15 page ‘Coffee Cupping and Tasting Guide’ to help you perfect the art of espresso cupping, the tasting technique used to evaluate the aroma and flavour profile of a coffee. 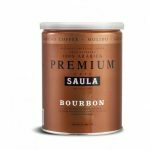 If you’d like to stock this wonderfully unique product then please please contact Nick or Lex on hello@thefoodieslarder.com.